The story of success goes on and on - with a new book on combinatorial chemistry, edited by Günther Jung! Combinatorial chemistry is a proven time- and resource-saving synthetic method of outstanding importance for industrial processes. Compound libraries help to save time and money, especially in the search for new drugs, and therefore play a pivotal role in solving the problem of the worldwide increasing demand for new and more active drugs. Not only substances, which are of interest for pharmaceutical chemistry, but also materials, catalysts, and biomolecules such as DNA or oligosaccharides are readily available with high structural diversities. 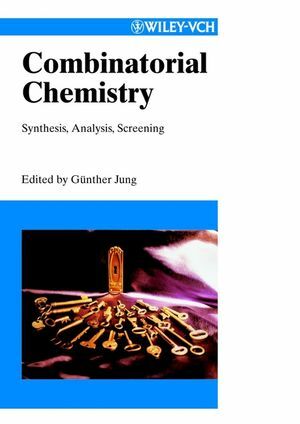 The broad scope of combinatorial sciences is reflected by this book, edited by Günther Jung: The synthetic methods discussed range from solid-phase to solution-phase synthesis, from preparations of small molecules such as amines or alcohols to those of complex biomolecules. Feasible methods, efficient techniques, new trends in automation, and state-of-the-art fast instrumental analytical and screening methods are presented with many practical tips and tricks for everybody working in combinatorial chemistry. This is the book written by specialists for specialists and for everyone aspiring to become an insider! It is an indispensible source of information for researchers working in organic synthesis, catalysis, biochemistry, and biotechnology, pharmaceutical and clinical chemistry, material sciences, and analytical chemistry. Günther Jung is the editor of Combinatorial Chemistry: Synthesis, Analysis, Screening, published by Wiley.